We are a leading Manufacturer of cocoa powder from Ahmedabad, India. Cocoa is an evergreen tree native to the deep tropical region of South America. 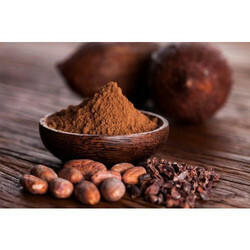 Pooja Traders is renowned Cocoa Powder suppliers in Ahmedabad, India. Our offered product is processed under favourable conditions using the optimum quality of chemical component and advanced techniques. Cocoa is rich in minerals. It is also a good source of selenium, potassium. It is also a good source of selenium, potassium.Cocoa powder is an unsweetened dark brown colored powder. Looking for Food Bakery Product Powder ?